Tom Breitling meets Tim Poster, surely the only college student carrying his own mobile phone at that time, and instinctively knows Tim is a guy he can trust – a bond forged over an expensive sandwich and Tim’s genuine and immediate offer to cover the check. A half-year after Steve Wynn erected the erupting volcano at the Mirage, Tim Poster sets up an 800 number and founds Las Vegas Reservation Systems (LVRS), a hotel room rental business built around the merchant model he devised during an entrepreneurial class at USC. “Looking back”, says Tim, “starting the room reservation business at that time was like being the guy who paid $24 to the Indians for Manhattan.” LVRS first-year revenues: $800,000. Tom Breitling, determined to be the next Bob Costas, gets his first television job at KHIZ-TV in Victorville, CA, home of Roy Rogers and Dale Evans. Because the sports spot is already taken, he starts as the weatherman and broadcasts high school sports from the sports anchor seat. LVRS second-year revenues: $1.6 million. Tim and Tom’s wildly successful partnership begins with a handshake on a frozen lake in Minnesota. LVRS revenues: $2.8 million. 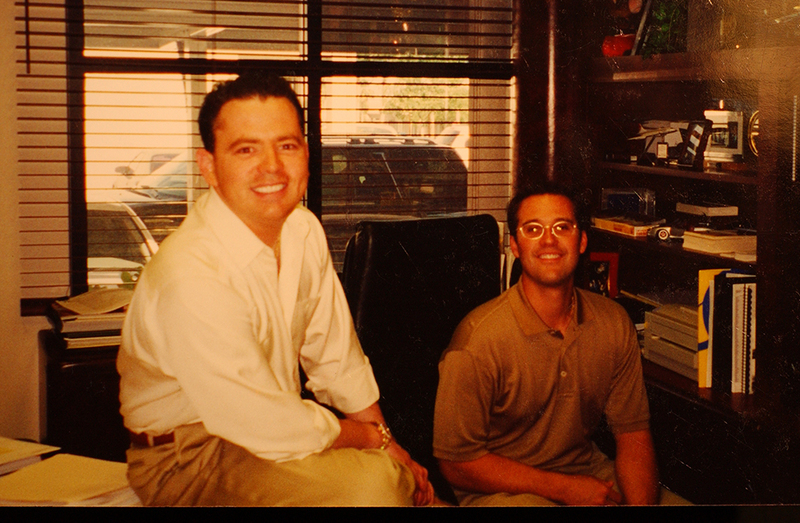 Tom, with a hundred dollars in his wallet, leaves his dreams of being an ESPN sportscaster (and the next Bob Costas) and drives his Honda Accord to Las Vegas to join Tim at LVRS. By now, 12,000 additional hotel rooms have come into the Las Vegas market with the opening of the Luxor, the Treasure Island, and the MGM Grand. LVRS revenues: $3.6 million. With larger blocks of rooms to offer, Tom and Tim begin creating air & hotel packages for Vegas vacationers. LVRS revenues: $4.8 million. Internet web browsers Explorer and Netscape Mosaic become popular as consumers begin to learn how to “surf the web”. LVRS revenues: $6.2 million. While traditional companies print brochures, Tom conceives one of the earliest websites featuring images of the exotically themed hotel rooms LVRS is offering – the pirate motif at Treasure Island, pyramid designs at the Luxor, and the medieval décor at the Excalibur. The site allows LVRS to respond to the market in an instant, based on demand, and update information immediately. At ages 27 and 28, Tom and Tim are millionaires. LVRS revenues: $8.5 million. Tom and Tim invest six month’s profit to begin developing Tom’s brainstorm – one of the first automatic online reservation systems – a fast, easy to use, five-click system that allows people to search, compare, and reserve hotel space via the Internet. LVRS sales: $12 million. “Every quarter we put in comes back dressed up as a dollar!” says Tim Poster. With the February 26 launch of their new online reservation system, LVRS grows exponentially. The partners form a new company, Travelscape, taking their ‘merchant model’ global. Sales climb 60% to $20 million. Travelscape takes off, offering rooms in 100 cities and 2,500 hotels. Barry Diller wants to buy Travelscape. He bets that the young entrepreneurs – to save the deal – will take $38 million less than the agreed upon purchase price and switches his offer at the eleventh hour. Firmly believing that a man’s word is his bond, Tim and Tom call Diller’s bluff and refuse. Travelscape continues to surge, selling reservations for 2 million room nights a year. Annual revenues: $100 million. Tom Breitling and Tim Poster make their first megabuck when they sell Travelscape to Microsoft’s Expedia for $105 million on Expedia stock. Breitling focuses on private equity investments through Breitling Ventures. Tom takes a seat on Expedia’s board of directors just as Barry Diller buys a 60% share of the company. When the dot-com bubble bursts, Expedia’s stock falls from $34 to $7. Tim serves on the board of Station Casinos. Expedia’s stock soars to $150 a share by summertime. Partners Tom and Tim negotiate with MGM Mirage Resorts and buy the legendary Golden Nugget for $215 million. Mark Burnett, legendary producer of “Survivor” and “The Apprentice”, turns his cameras on Tim and Tom for a new reality show, “The Casino”. At the stroke of midnight on January, 2004, Tom and Tim take ownership of the Golden Nugget, the longest continually operating casino in Las Vegas, making them the youngest casino owners ever in the state of Nevada. They return “Vintage Vegas” glamour and style to downtown Las Vegas. Tony Bennett headlines at the Nugget’s intimate, 425 seat showroom. Tim and Tom sell The Golden Nugget for $113 million in profit, making their second $100 million before they turn 40. Tom publishes Double Or Nothing, a story of their entrepreneurial journey. Tim and Tom join Steve Wynn at Wynn Resorts to assist in opening the new Encore resort in Las Vegas and lead strategy and development for the company. Tom marries Vanessa Tarazona. They begin having children: Aliana, Valentina and Thea. The duo form Ultimate Gaming with Frank and Lorenzo Fertitta in an effort to pursue regulated online gaming in the U.S. Due to a lack of legislation, the company withdraws from the market in 2014. Ultimate Gaming becomes the first licensed legal real-money online gaming company in the United States by dealing the first hand of legal online poker. Tom has transitioned back to private equity investing and is married with three children (all girls). Tom Breitling’s entrepreneurial journey began in 1993. He moved to Las Vegas with $100 in his pocket to join his business partner, Tim Poster, to help run the startup company Las Vegas Reservations Systems (LVRS). Shortly after arriving, Breitling realized that their hospitality, technology, entertainment, and investment-related enterprise would have to focus on innovation if they were to be game-changing. They knew that they would have to do something big. But business is all about timing. And luckily Breitling and Poster had started LVRS at precisely the right time! Their office opened JUST after Steve Wynn unveiled The Mirage before 40,000 revelers on the Vegas Strip. It was the first property opened on the Strip in over 10 years, and, sure enough, many themed hotels and resorts followed quickly after. The Excalibur, Treasure Island, The Luxor, the MGM Grand, New York, New York, The Bellagio – the local economy went into overdrive, and there was no better time to be in the hotel reservation business in Las Vegas. Up until that point, in the mid-1990’s, most travel reservations were made through brick-and-mortar agencies. But Breitling noticed that many customers were starting to ask if they could make reservations over the Internet, and his game-changing idea began to take shape. While attending a conference, Breitling heard a rumor that the pricing information that was available ONLY to travel agents would soon be available to the general public, online. Using some initial guidance from a friend in the industry, and their own ingenuity, he and Poster developed a website that reduced reservations to five simple clicks. Poster and Breitling quickly realized that this new model would also work for securing reservations at hotels and with airlines, both across the country and the world. Their expanding company, LVRS, was renamed Travelscape, and the partners went on to create thousands of jobs and provide billions of dollars of economic impact to the state of Nevada and the world economy as well. A year after the business went online, revenues soared to more than $100 million. A year later, after much consideration, in the beginning of 2000, Breitling and Poster decided to sell Travelscape to Expedia for $105 million. It was the cash flow they needed to take their buying power and influence in Las Vegas to the next level. 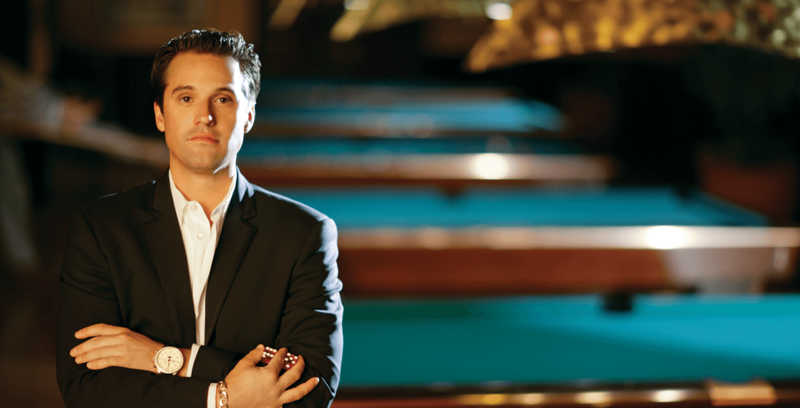 Poster convinced Breitling to go all in on his childhood dream: owning a casino. 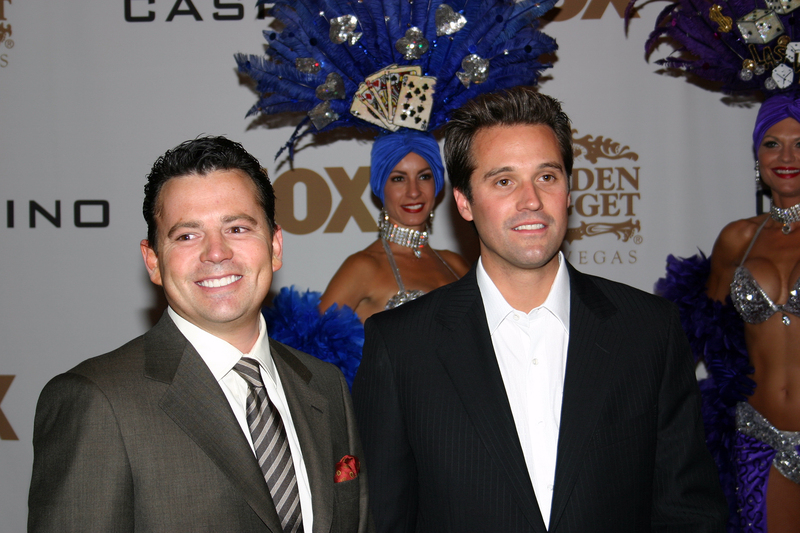 Their earnings from the Expedia deal helped finance the purchase of The Golden Nugget in downtown Las Vegas in early 2004. Straight out of a Hollywood movie, the partnership had the time of their lives. They brought in top talent like legendary crooner and showman Tony Bennett and created a buzz that shifted attention from the themed resorts, recently constructed on The Strip, toward the charm of old school Las Vegas. Poster and Breitling were living lives that average Americans can only dream about and were taking Las Vegas by storm. Then, a high roller nicknamed “Mr. Royalty” walked into the Golden Nugget, got hot on a $25 million winning streak, and ended up taking the casino for almost $8.5 million playing craps. After the lengthy (and nerve-wracking) reign of Mr. Royalty came to an end, the duo regrouped in the typical indomitable fashion of Breitling and Poster, and – having weathered the storm – earned back their losses and made the Golden Nugget profitable once more. Less than a year later, Breitling and Poster sold the casino for more than $113 million, profit.